This Autumn we are thrilled to unveil an original range of innovative and modern Häfele wirework products. Designed in Italy with renowned Italian style, the range features a stylish flat-bar design, offering a great alternative to the traditional round-bar. This Häfele own brand range of wirework is great value for money, with products starting at only £66.49 Trade List Price, you’ll find a product for every pocket. Ideal for Kitchen manufacturers, this offering is perfect for your customers looking for modern, stylish storage solutions. Contemporary design, paired with dependable Häfele quality, makes this range ideal for daily use in the home. Built with solid white bases for secure and stable installation, all these new products are designed to be easy to retrofit in existing spaces. In a world where we’re accumulating more and living in less space, smart storage is now an imperative for homeowners and therefore is in very high-demand. This new range of Häfele wirework transforms the way we face this modern challenge, allowing users to both access their possessions with ease and store their belongings more efficiently. 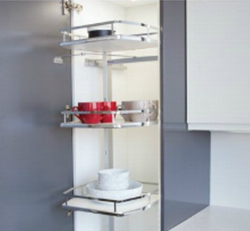 The shelves of this desirable corner unit operate independently for ease of use and maximum flexibility. Easily fitted directly on a cabinet shelf or with a sturdy frame, this Häfele wirework exclusive is ideal for retrofitting into existing furniture. To fit with the rest of the collection, this is designed with a sleek and stylish flat-bar design, making it unique to Häfele customers. 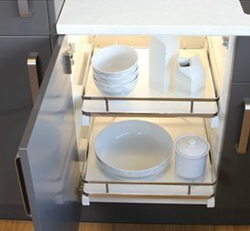 This unit is cleverly crafted to offer users easy access to the back of their cupboards without removing all their items. Available in a variety of cabinet widths, the range spans all possible application needs, and allows you to install easily and with precision. Ideal for kitchens where space is at a premium, this product won’t let you down! 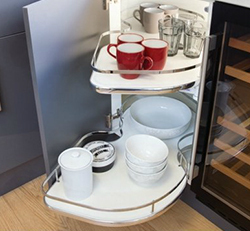 This versatile and durable swing out larder is mounted on both the side and the base for a secure fit in your cupboard. With access to produce from 3 sides, this is a revolutionary product for customers used to hunting around in the back of their larders. 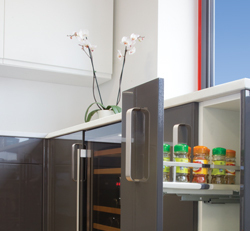 Built to sit behind hinged doors, this stylish larder unit is light and smooth in operation, making it ideal for customers from all walks of life. This full extension full out is the perfect way to make the most of the tricky thin cupboard space usually used to store baking trays and roasting tins. Fitted into the left hand cabinet to conceal the runner, this pull out is ideal for storing spices, herbs, oils and jars; making it an efficient and space saving solution for a modern home.